Tutoring books can be a great resource for training and inspiration. This page is a place for readers to share their thoughts about current titles related to tutoring--including books on education, teaching, coaching, homeschooling, and more. Post your thoughts on education titles below and read on for other visitors' reviews. When your review is posted, you'll receive an email with simple instructions for completing your free (and optional) online profile. Easy! Please share your opinions about any book related to tutoring. It could be a tutoring title or a book about teaching, education, homeschooling, or another related subject. Be sure to include the title and author of the book. If you have a graphic of the book cover, please include it! Thanks for your review. To add graphics, click the button and find the first one on your computer. Select it and click on the button to choose it. 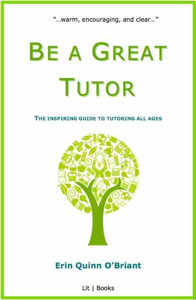 Take your skills from good to great with Be a Great Tutor, the inspiring guide to tutoring all ages. Enjoyable to read and easy to understand, Be a Great Tutor leads both beginning and experienced tutors step-by-step to more successful sessions. Erin Quinn O'Briant, MFA, editor of www.Tutoring-Expert.com, explains three fundamentals of tutoring. With major contributions from award-winning education nonprofit leader Christopher Balme, O'Briant guides readers through applying these skills in reading, math, writing, test preparation, and study skills. Other chapters include working with student groups, e-tutoring, building a successful independent tutoring business, and managing the interpersonal side of the job. Inspiring examples of success stories throughout the book make the student-centered principles behind Be a Great Tutor clear and easy to apply. For both independent tutors and those in a school or nonprofit, Be a Great Tutor is a must-have resource. Find the book in paperback or Kindle. Looking for free book excerpts? Right here! Return from Tutoring Books to Tips for Tutors.